The coneflowers in your home garden, also commonly known as echinacea, may suffer from severe cosmetic damage as well as annihilation that calls for removal. Get to know the types of disease problems associated with your coneflowers to protect the aesthetic integrity and health of your gardening space. Become familiar with what to watch for as well as how to respond to keep your flowers vigorous and able to recover from disease. Vigorous coneflowers are more likely to avoid or deal with a disease problem than weakened or injured plants. Grow your coneflowers in locations that provide full sun exposure to partial shade for optimal growth. These flowers prefer moist, well-drained soil and good air circulation. Tolerances include high temperatures and drought conditions once fully grown, according to the Clemson University Extension. A bacterial disease that affects coneflowers is bacterial leaf spot. This leaf spot is caused by the bacteria from the Pseudomonas species as well as the Xanthomonas species, reports the University of Illinois Extension HortAnswers. Bacteria overwinter in plant debris and invade wounds or natural plant pores. Powdery mildew is a fungal infection that attacks coneflowers. Caused by many fungal species, pathogens are spread sporadically in the air, land on host plants and germinate during spring when temperatures warm up and rise above 60 degrees F.
Bacterial leaf spot on coneflowers result in red/brown spots caused by the Pseudomonas species and brown spots with yellow borders caused by the Xanthomonas species. Leaves appear malformed and leaf tissue within spots often die. Powdery mildew on coneflowers appears during periods of high humidity as splotchy areas with the growth of a white substance resembling powder, as the name suggests. This problem results in malformation, curled leaves, discolored foliage and diminished vigor. For control of bacterial leaf spot, there are no chemical management methods, so natural care is essential. 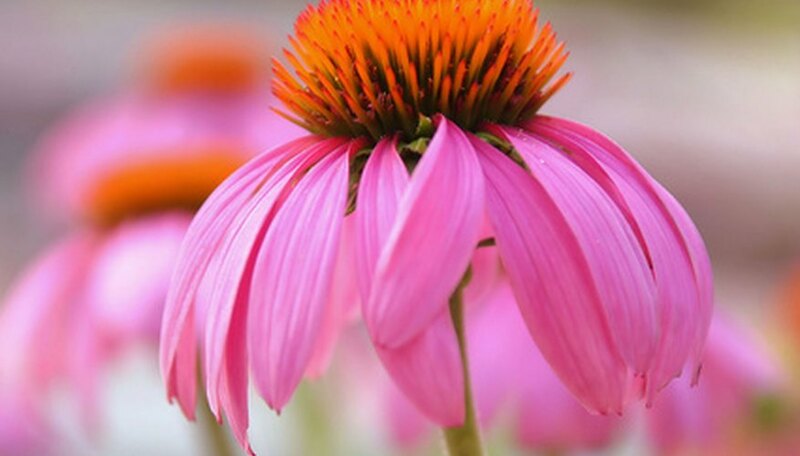 Maintain coneflowers free of injury to prevent the invasion of bacteria through wounds. Additionally, do not handle plants while they are wet as coneflowers will bruise, making them more vulnerable to infection. For powdery mildew, remove and destroy affected plant parts and sanitize pruning tools between each cut and from one plant to the next to prevent spread of fungal pathogens. Chemical control is an effective management method for the incidence of powdery mildew on coneflowers. Once a sign of infection is apparent, apply a spray fungicide to all leaf surfaces. Use a chemical containing the active ingredient myclobutanil or triadimefon, according to Clemson University Extension. Contact your local county extension agent or a licensed professional for assistance.